Commission for Competitive and Fair Taxation set up by Scottish Conservatives. Middle earner band of income at about 30 per cent proposed. Opposition parties warn of impact on public services spend. A Scottish Conservative-backed commission proposes a new income tax band for “squeezed middle earners”. A new income tax band should be introduced to ease the pressure on “squeezed middle earners” in Scotland, a commission has proposed. The recommendation was made in a report by a commission set up by the Scottish Conservatives to consider how new tax powers coming to the Scottish Parliament as a result of the Smith Commission on further devolution should be used. The Commission for Competitive and Fair Taxation in Scotland proposed a new middle band of income tax between the current 20 per cent and 40 per cent bands, at about 30 per cent. This should be introduced “when affordable” and would "ensure fewer aspirational families are dragged into the higher tax rate band" of 40%. The commission said if Scotland is to remain competitive, its overall tax burden should be lower than that in the rest of the UK. One would hope that the attractiveness of the tax rate and the incentive to work and earn more would actually result in more tax yield over time. Commission chair and former CBI Scotland director Iain McMillan said: "The middle earners, there's no doubt about it, their tax burden in recent times has not been improved, so we would do that. "If it was implemented right now it would probably raise less tax, but over time, one would hope that the attractiveness of the tax rate and the incentive to work and earn more would actually result in more tax yield over time." The commission comprised business leaders and economic experts, and also called on Scottish politicians not to raise the 45 per cent top rate of income tax. 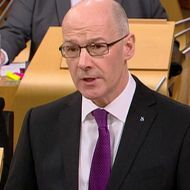 Other recommendations included a freeze in business rates for the course of the next Scottish Parliament and the replacement of Air Passenger Duty with a new Departure Tax linked to travel distance. Scottish Labour's public services spokeswoman Jackie Baillie said: "With the SNP already planning half a billion pounds' worth of cuts to local budgets for schools and childcare, these unfunded Tory plans will only pile on more cuts affecting our young people." The commission’s report was published with 100 days to go until the next Scottish Parliamentary Elections.